Driving a slow and thoughtful character study into a full-on violent crime thriller. Ryan Gosling is a driver. During the day, he’s a part-time Hollywood stunt man and a part-time car mechanic. During the night, he seems to spend most of his time helping out with criminal activities. All of the time, he’s a leading man. He has a quiet and unassuming charm about him that can drive girls wild, and grateful bosses (like Bryan Cranston) since he’s so trustworthy and capable. 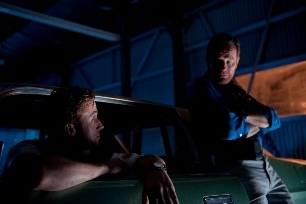 Ryan Gosling and Bryan Cranston in DRIVE. Photo credit: Richard Foreman. The girl is Carey Mulligan, looking much older and more experienced than her 16 year-old Jenny from “An Education” (2009). Again, sometimes girls fall for the wrong guy. But sometimes, the guy isn’t bad, he just makes some wrong turns. For the few questionable choices that the driver made, every choice the filmmakers made was perfect. The film has such an artistic appeal to it with interesting transitions and scenes where the characters might just sit silent for five minutes, but we still know what’s going on. The driver may drive at high-speeds and flip cars in Hollywood crash ‘em up action movies, but “Drive” is anything but. It’s actually not so far-fetched for Gosling to refer to it as a “John Hughes superhero movie.” There’s a background feel to it that makes it seem like an ‘80s chick flick, even though it’s nothing like that. It starts with the speed of a minimalistic character study, but then we don’t even learn our hero’s name. I’m glad it started that way because it got me more interested in the crime and money-stealing plot. “Drive” is slow, thoughtful, and interestingly shot and paced. Oh, and it’s violent. Things get bloody as there is a tendency for heads to get smashed in when the money and livelihood of thugs are in jeopardy. Be sure you know your driver and your route home well after seeing this as you could be looking over your shoulder for the rest of your life. The Disappearance of Alice Creed (2009) - Interesting characters in a thriller plot in a perfected independent film. The Town (2010) - A thriller driven by characters and their relationships just as much as plot.